Following the invitation of Gregor Louisoder Umweltstiftung, European Wilderness Society was finding their way through the big city-jungle of Munich to join the presentation of the brandnew, fresh from the press educational material about wolves in Bavaria. 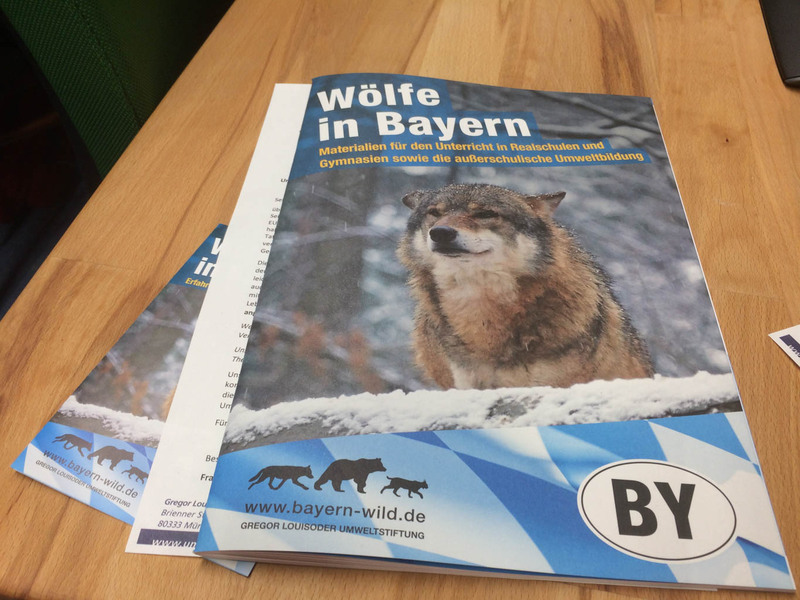 Outcome of a collaboration between the Gregor Louisoder Umweltstiftung and Peter Sürth, wolf educator and expedition guide, is a very informative journal about the wolf focussing on the situation in Bavaria. It is giving practical examples and inviting young people and teachers to approach this topic project-based. After introducing words by Claus Obermeir, Chairman of the Gregor Louisoder Umweltstiftung, Franziska Baur, subject specialist for nature conservation, was giving interesting and promising insights into the educational wolf material which is addressed to teachers to make it part of the biology school education for 11 to 19 year olds. The idea: Spreading important knowledge as well as including the wolf – as it is part of our reality now- in school education. The Gregor Louisoder Umweltstiftung also developed the first wolf hiking trail in Bavaria. As a sign of our appreciation for their work and to emphasize our common goal – a peaceful coexistence between us people and wolves – along with us we brought a (wooden) wolf as support for their very first Bavarian wolf pack in a long time. Welcome back, old friends! After very welcoming conversations and interesting story sharing time with Bernd Louisoder, founder of the Gregor Louisoder Umweltstiftung, we got to meet different nature conservationists, wolf friends and experts, and wolf-interested people. In a following event of the LBV, Stefanie Morbach was holding a presentation about wolves, wolf-human-conflicts and management ideas, in a tavern nearby. The discussion that followed was very moderate. There were people supporting the return of the wolves and others who mainly communicated their concerns and fears. While challenges of herd protection, most of all for hobby and small livestock farmers, was an important topic, there were voices not understanding and supporting the wolf’s strict protection status. ‘Since the wolf is coming back anyways and increasing in number really fast, why are we not allowed to hunt it while there are not too many of them?’ was one concern. Other people communicated a not very welcoming attitude, but showed a true acceptance for wolves at the same time and an acknowledgement for the need of a common strategy. Acceptance and working together to find solutions – a path including farmers, hunters, nature conservationists and all people – was seen as the key to a good future. One point on which many people agreed on – there is a need for change. ‘Walking some miles in another person’s moccasins’ – trying to emphasize with farmers as well as the need of small farmers to support each other in keeping their animals safe – were some shared thoughts and suggestions. Some open questions, open ends. But people willing to talk and share their thoughts and concerns, trying to reach each other’s hands. Together? Let’s hope for it. Another step into a good direction for sure.